Experimental rat endocarditis model due to methicillin-resistant S. aureus. Hady, W. A., Bayer, A. S., Xiong, Y. Q. Experimental Endocarditis Model of Methicillin Resistant Staphylococcus aureus (MRSA) in Rat. J. Vis. Exp. (64), e3863, doi:10.3791/3863 (2012). Endovascular infections, including endocarditis, are life-threatening infectious syndromes1-3. Staphylococcus aureus is the most common world-wide cause of such syndromes with unacceptably high morbidity and mortality even with appropriate antimicrobial agent treatments4-6. The increase in infections due to methicillin-resistant S. aureus (MRSA), the high rates of vancomycin clinical treatment failures and growing problems of linezolid and daptomycin resistance have all further complicated the management of patients with such infections, and led to high healthcare costs7, 8. In addition, it should be emphasized that most recent studies with antibiotic treatment outcomes have been based in clinical settings, and thus might well be influenced by host factors varying from patient-to-patient. Therefore, a relevant animal model of endovascular infection in which host factors are similar from animal-to-animal is more crucial to investigate microbial pathogenesis, as well as the efficacy of novel antimicrobial agents. Endocarditis in rat is a well-established experimental animal model that closely approximates human native valve endocarditis. This model has been used to examine the role of particular staphylococcal virulence factors and the efficacy of antibiotic treatment regimens for staphylococcal endocarditis. In this report, we describe the experimental endocarditis model due to MRSA that could be used to investigate bacterial pathogenesis and response to antibiotic treatment. Inoculate a loopful of MRSA culture from a stock tube at -80 °C to a sheep blood Trypticase Soy agar (TSA) plate (see Table of specific reagents and equipment), and incubate at 37 °C for overnight. Check the purity of the culture on the blood agar plate (similar colony phenotypes) to make sure there is no contamination. Pick one colony from the sheep blood TSA plate and inoculate the colony into 5 ml Trypticase Soy broth (TSB) in a 15 ml snap-capped tube. Incubate at 37 °C overnight with shaking at 200 rpm. Cut polyethylene tubing (PE10; Becton Dickinson, order no. 427401) to 10 cm lengths, and melt one end by pressing the tip with a sterile forceps. The purpose of sealing one end of the catheter is to avoid bleeding during catheterization. Place Sprague-Dawley rat (Harlan, Indianapolis, Ind. female, 250-300 grams) in a chamber containing isofluorane-oxygen gas mixture (50%:50%) until the anesthetic takes effect (e.g. muscles are relaxed and pedal reflexes are absent), and maintain animals in an anesthetized state during the surgery with the gas mixture. Clean the neck area from chin to just below the sternum with Betadine and 70% ethanol. Use sterile technique throughout the surgery. Make an incision (1-1.5 cm) vertically through only the skin layer of the neck above the sternum. Using blunt dissection, separate the fascia to expose the right carotid artery using 2 pairs of curved toothed forceps. Gently pull the artery up out of neck cavity, and place two 10 cm lengths of silk suture under the artery and tie off the artery at the exposed cephalic end, place a clip on the artery to prevent bleeding. Make a small hole in the top of the artery using a catheter introducer (Becton Dickinson, order no. 406999), insert a catheter with a forceps through the hole in the artery, remove the clip and push down the catheter toward the heart until resistance is met. Tie the loose suture around the caudal end of artery and secure the catheter in place with the silk suture when the catheter is in place as determined by: i) the length of catheter inserted (4-5 cm); ii) resistance to further advancement; and iii) pulsation of the catheter with the heartbeat. Leave the catheter in place for the remainder of the experiment. Cut excess suture and catheter ends, and make sure that there is no bleeding from the catheter. Tuck the loose ends under skin of the neck and close the skin with skin clips. Place the rat in the cage in a warm place until recovered from the anesthesia, and provide food and water. Check the rat frequently during and after recovery from anesthesia. This surgery is a "Category E" procedure. The procedures produced pain is unrelieved by analgesics since MRSA infections accompanying distress to the animals. Infection can be performed between 1 and 7 days post-surgery, but keep consistent within experiments. Clean rat tail with 70% ethanol, and inject 0.5 ml MRSA at a desired cell count (104 - 106 cfu/animal for the most S. aureus strains) with 27 G 1/2 inch needle intravenously from the tail vein. Caution: MRSA culture belongs to biosafety level 2 (BSL2) and has moderate potential hazard to personnel and the environment. 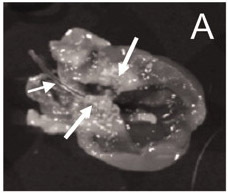 Hold pressure at the site until hemostasis occurs before returning the rat to the cage. Sacrifice rats by ip injection of sodium pentobarbital (200 mg/kg) after 1 to 6 days post-infection. Place the rat on her back and wipe the chest with 70% ethanol. Make a V-shaped incision in the chest below sternum, and cut the cartilage of ribs on each side of sternum to expose the heart. Pull the heart up gently, and clip through the heart tissue close to the aorta and dissect up to free the heart. Place the heart on a sterile Petri dish with 4x4 inch gauze inside, make a cut through the left ventricular inner wall and open the left-sided chamber. Check visually for catheter placement. Examine and remove vegetations from the valve with scissors and forceps. Weigh and homogenize the vegetations, and make serial dilutions with PBS for quantitative culture. Immediately after inserting the catheter into the artery and pushing down the catheter about 4-5 cm toward the heart, a resistance will be experienced. If no resistance is sensed, the catheter may not have successfully been inserted into left side of the heart chamber, which may affect the placement of catheter. A correct catheter placement published previously9 is shown in Figure 1. Part of MRSA infection samples need to be quantitative cultured the make sure the exact viable bacterial count for the infection and purity of infection sample. In addition, the organisms recovered from vegetations should be the same as those used in the inoculum. Table 1 presents an example of virulence of a S. aureus strain in the rat endocarditis model which was published previously9. All animals challenged with inocula of 105 and 106 cfu and sacrificed between 3 to 6 days after infections developed endocardits with high S. aureus densities in cardiac vegetations, as well as kidneys and spleen (Table 1). Rats with sterile valve cultures are considered uninfected. Figure 1. The catheter is in a correct place (left-side of heart chamber), and numerous vegetations are visible around the aortic valves9. a SD, standard deviation. P < 0.001 with respect to 105 or 106 CFU-challenged animals. Table 1. S. aureus density in cardiac vegetations with different inocula in the rat endocarditis model9. The rat endocarditis is an important and well-characterized animal model for in vivo studies in the pathogenesis and antimicrobial agents in the treatment of bacterial infections 9-11. In addition, rat endocarditis model represents a composite of acute and sub-acute infections, and closely mimics human counterpart and human native valve endocarditis. Moreover, accompanied by an in dwelling catheter, it represents a classic biofilm-associated infection, a common and difficult issue in clinical settings 12. Most importantly, results generated with the rat endocarditis model are highly reproducible. The pathogenicity of S. aureus in the rat endocarditis model, as other animal models, may vary depending on a number of parameters, including inoculum dose, bacterial growth phase (log vs. stationary), age of animals, and animal genetic background 9, 13. Surgical success rates are highly dependent upon the technical expertise and surgical skills of the researcher. Success in the surgery can be measured by: 1) the number of animals that recover from the surgery; 2) catheter in a correct place at time of sacrifice; and 3) vegetations present on cardiac valves. In summary, the rat endocarditis is a practicable, reproducible and important model that mimics the clinical situation closely. Therefore, it is appropriate for all fields of sepsis research, including microbial pathogenesis and efficacy of antimicrobial agents in the treatment of experimental endocarditis syndromes. This work was supported by the U.S. National Institutes of Health [grant R01AI-39108 to A.S.B.] and the American Heart Association [grants SDG 0630219N and AID 09GRNT2180065 to Y.Q.X.]. Petti, C. A., Fowler, V. G. Staphylococcus aureus bacteremia and endocarditis. Cardiol. Clin. 21, 219-233 (2003). Bashore, T. M., Cabell, C., Fowler, V. Update on infective endocarditis. Curr. Probl. Cardiol. 31, 274-352 (2006). Fowler, V. G. Jr, Justice, A., Moore, C. Risk factors for hematogenous complications of intravascular catheter-associated Staphylococcus aureus bacteremia. Clin. Infect. Dis. 17, 313-320 (1993). Wisplinghoff, H., Bischoff, T., Tallent, S. M., Seifert, H., Wenzel, R. P., Edmond, M. B. Nosocomial bloodstream infections in US hospitals: analysis of 24,179 cases from a prospective nationwide surveillance study. Clin. Infect. Dis. 39, 309-317 (2004). Hoen, B. Special issues in the management of infective endocarditis caused by gram-positive cocci. Infect Dis. Clin. North Am. 16, 437-452 (2002). Moise, P. A., Hershberger, E., Amodio-Groton, M. I., Lamp, K. C. Safety and clinical outcomes when utilizing high-dose (> or =8 mg/kg) daptomycin therapy. Ann. Pharmacother. 43, 1211-1219 (2009). Sakoulas, G., Brown, J., Lamp, K. C., Friedrich, L. V., Lindfield, K. C. Clinical outcomes of patients receiving daptomycin for the treatment of Staphylococcus aureus infections and assessment of clinical factors for daptomycin failure: a retrospective cohort study utilizing the Cubicin Outcomes Registry and Experience. Clin. Ther. 31, 1936-1945 (2009). Xiong, Y. Q., Willard, J., Kadurugamuwa, J. L., Yu, J., Francis, K. P., Bayer, A. S. Real-time in vivo bioluminescent imaging for evaluating the efficacy of antibiotics in a rat Staphylococcus aureus endocarditis model. Antimicrob. Agents Chemother. 49, 380-387 (2005). Peerschke, E. I., Bayer, A. S., Ghebrehiwet, B., Xiong, Y. Q. gC1qR/p33 blockade reduces Staphylococcus aureus colonization of target tissues in an animal model of infective endocarditis. Infect. Immun. 74, 4418-4423 (2006). Ganesh, V. K., Rivera, J. J., Smeds, E. A structural model of the Staphylococcus aureus ClfA-fibrinogen interaction opens new avenues for the design of anti-staphylococcal therapeutics. PLoS Pathog. 4, e1000226 (2008). Boles, B. R., Horswill, A. R. Staphylococcal biofilm disassembly. Trends Microbiol. (2011). Tseng, C. W., Sanchez-Martinez, M., Arruda, A., Liu, G. Y. Subcutaneous Infection of Methicillin Resistant Staphylococcus Aureus (MRSA). J. Vis. Exp. (48), e2528 (2011).